My best mummy moment of this week has to be my youngest daughter’s first class assembly. It was such a gratuitous treat to watch all the itty bitty cuties from Foundation file into the hall, saucer-wide eyes searching for their grown-up – and then smiling (and maybe even waving) when they gleefully caught sight of them. It goes without saying that my little darling’s role was pivotal to the entire performance. Pivotal in that it was a non-speaking part in which she held up a piece of paper in front of her face at the exact moment she had to. Timing is everything in these productions of course. As an added bonus, my elder daughter was sitting on the floor right in front of me too (I was in the front row of parents naturally, since I had camped outside the hall doors the night before to ensure a good seat). Our family has a long tradition of shunning the limelight. Since we are also blessed with lack of stature, it didn’t take my older daughter long to realise she could easily avoid detection in any school play by simply hiding behind someone – anyone – taller than her. I have some lovely photos of her arms and legs. She was beaten by the ballet teacher however, who chose her as one of those to be at the front of the Christmas line up. The thwarted look on her face was priceless. I don’t blame her at all, since I’m just the same. Rather than simply labelling it as shyness however, I like to see it as a kind of internal self-confidence. Some people just don’t need or enjoy external affirmation in the same way others do. In fact some of us aren’t convinced when we hear positive comments from others, because what matters more to us is how well we think we’ve done. This is probably why I’m reading Quiet by Susan Cain. The book argues that despite accounting for at least a third of the population, introverts get a bad rap because our culture celebrates and rewards the exact opposite. However, Cain believes that the extrovert is lost without his self-contained counterpart and that society should value the reserved. Of course I agree! Perhaps not surprisingly then, when I decided to craft a piece of crime fiction for this competition I chose the underdog as my protagonist. Unfortunately for the extrovert in the story, his days are numbered. Not that I’m suggesting us ‘quiets’ should rise up and murder the noise makers. It’s just that sometimes the extroverts need to shut up and listen – and likewise sometimes the introverts need to step outside their comfort zone. It takes all sorts to make our jolly little world go round – some of us are destined to tap dance up to stage to collect our Oscar, while others will be holding up the cue cards for that acceptance speech (preferably in front of our faces). But do bear in mind that no one plans a murder out loud…! Great blog Vanessa....I'll be watching my back! I'm not sure which category I fall in. I can't take myself too seriously to make the effort to self-analyse. But I hope that when it's important I have the capacity to be introvert and listen....especially to my children. Ah, enough about you!!! What about MEEEEEE????!!!! Oh, ,alright, it was rather good. Thank you ladies (I think AkiLady?!). Yes, I think I'm probably a bit of both, and then changing every now and again too! Thank you for visiting. Definite introvert! I think blogging probably attracts a lot of introverts. I can express thoughts and feelings without feeling a thousand eyes on me. 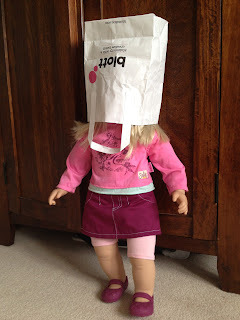 My daughter, however, is an absolute extrovert. She dances, sings and charms her way around! Definitely takes after her daddy!